NEW SHOW: The Tuesday, May 19th edition of TCMS is now up. Very eventful day which is somewhat explained in the last segment kept the show from being out earlier. Topics include the Mayor's race, the OKC NRA employee who shot at an intruder, and the proof that the BOk Center will never pay for itself, no matter how much the Tulsa World spins that it will. Click here to download show. I can no longer play your podcast with my W2Ksp4 and WMP9. Others still play fine, but not Tues May 19th edition. Windows Media Player cannot play the file. The file is either corrupt or the Player does not support the format you are trying to play." By the way, have listened to all the other podcasts, and love it! It is great to hear from you again! 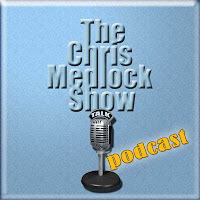 Another day without hearing my Medlock blogcast. Your link is dead (no pun intended). But alas and woe is me, where fore art thou Chris; I am having withdrawls! It took a while, but I found the broken feed code and all of the links for TCMS in the sidebar on the right should now work. To those telling me they are still not getting the podcast, I have run the feed through feed validator, checked all the links and everything works on my end, so the problem is on your side. Sorry and thanks for listening. TCMS 4 for this Podcast located on the upper right, does not work nor the link ("click here") embedded within the written material. TCMS 1-3 and their associated links all worked fine and they still do. I have DSL, an up-to-date computer, running XP. Windows media player cannot play the file you provide for TCMS 4. My validator says something(s) remain to be fixed. OK...I've now spent 2 hours of my Sunday and skipped church to address this. The file worked perfectly in every media player except Windows Media Player. The only thing I did different with this file from the others was to use extended metatags. I couldn't believe that this would lock up WMP, but guess what...as usual with Microsoft...it did. I re-compressed the mp3 file from the original .wav file and uploaded it to the server. It now works. If it doesn't on your end, download Apple's Quicktime, which is a far more stable player.